The Tampa, Fla., provider of MSP and technology tools is distinguishing itself further with the formal acquisition of Arlin Sorensen's HTG coaching, consulting and peer group organization. Formalizing a strategic relationship dating to 2008 and a personal relationship between HTG CEO Sorensen and ConnectWise CEO Arnie Bellini that goes back even further, the companies announced the deal on Friday. Terms were not disclosed. "This brings together a shared vision to help technology solution providers (TSPs) meet their full potential," Bellini said in a statement. "We believe that by combining ConnectWise's award-winning business solutions with HTG's best-in-class business coaching program and extensive peer-to-peer network, we are creating an extraordinary ecosystem that gives all TSPs the opportunity to thrive." With the move, Bellini is recommitting to a "community first" approach for ConnectWise, as the company faces competition with substantial backing from private equity and other investors. HTG, a name that evolved from Heartland Technology Groups for the organization Sorensen founded in Harlan, Iowa, has members from 500 companies worldwide, hosting more than 50 meetings and events for those members annually. The core value of the organization comes from the in-person, small-group meetings among similar technology provider companies from different markets. Executives from those companies could share best practices and analyze each other's business opportunities and problems in a non-competitive setting. ConnectWise CEO Arnie Bellini (left) and HTG CEO Arlin Sorensen. 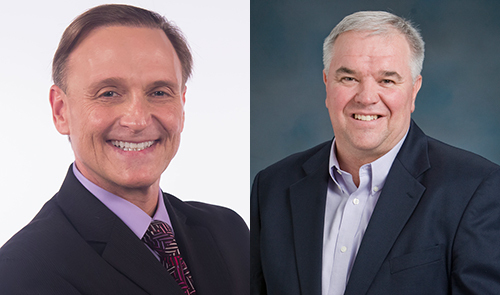 "Arnie and I have shared a belief in the value of education, coaching and community as key ingredients for partner success," said Sorensen, who will remain as head of the new HTG business unit within ConnectWise. "I'm excited to be part of an organization that understands the value of HTG's programs, and I'm looking forward to amplifying the reach of HTG thought leadership and creating new transformative programs that will enable TSPs to take control of their destinies." Initial public reaction from HTG vendor partners who compete with ConnectWise was positive. For example, one company that could look askance at the deal would be Datto, which was recently acquired by Vista Equity Partners, which then merged the backup vendor with another of its holdings, Autotask, a direct ConnectWise competitor. Yet Rob Rae, vice president of business development at Datto, seemed to take at face value the merged companies' stated commitment to carry on with business as usual with vendor partners. "As a longtime sponsor of HTG, we want to congratulate Arlin and the entire HTG community on this major milestone in their 17-year history. We also extend our congratulations to ConnectWise for investing in the strongest MSP Peer Group Community in the business" Rae said in an e-mailed statement that also extolled the value of HTG's historically vendor-agnostic forums for open dialog among peers, benchmarks and best practices. "We look forward to many more years of continued partnership with both the HTG and ConnectWise communities." With its reputation as a relatively honest broker in its open approach in the MSP industry, evidenced by the broad vendor participation in its annual IT Nation conference, ConnectWise has unique credibility to create a safe space for the HTG model to thrive and even scale. But ConnectWise will have to treat its new peer-focused jewel with extreme care.